File Photo: DHL delivery vans. 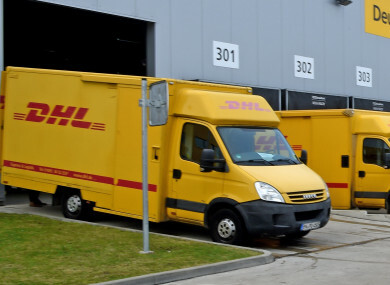 THE IRISH ARM of international logistics giant, DHL has been ordered to pay €72,042 to an accident-prone van driver in an unfair dismissal action. This follows the Labour Court awarding Michael Coughlan two years pay when finding that he was unfairly dismissed by DHL Express Ireland Ltd after his company van collided with fencing at a DHL depot in Cork causing €2,500 worth of damage. The accident in October 2015 followed Coughlan going on a refresher training course after he was involved in accidents in DHL vans in 2012 and 2013. In its ruling, the Labour Court ruled that the summary dismissal imposed on Coughlan by DHL “was disproportionate and unwarranted in all the circumstances”. The court also found that DHL did not give due consideration to imposing an alternative and more proportionate sanction on Coughlan or give him the option of contributing to the cost of the repairs to the company van necessitated by his error of judgement. The court also found that DHL gave undue weight to Coughlan’s previous accidents while driving DHL vans. Coughlan received two separate 12 month written warnings for the accidents in 2012 and 2013 and the court found that the decision to dismiss him was informed to no small extent by those previous incidents, pointing that the warnings clearly provided for their expungement after the 12 month period. The case was before the Labour Court after DHL Ireland appealed a ruling by a Workplace Relations Commission (WRC) Adjudication Officer which found that Coughlan was unfairly dismissed and ordered his reinstatement. The company cannot accept this level of negligence and poor judgment from a driver who takes a van on public roads on a daily basis. It is the company’s opinion that you were driving carelessly and your poor judgment caused over €2,500 of damage to the driver’s side of the van when you collided with the fencing. They stated that “this is an extremely serious issue in light of your history with causing damage to both the company van and customer property”. The company added that it had previously provided Coughlan with substantial training and had gone to extensive efforts to ensure he was driving in a safe manner. Coughlan appealed the decision internally pointing out that the October 2015 accident “was just an error of judgement”. I do not accept that we cannot and should not consider the other serious incidents that you have been involved in over recent years. As a responsible organisation we have made every effort to assist you through retraining in an effort to address any driving skills; however, we now need to recognise the duty of care we have to the public, other staff and to you, yourself. Following the 2013 accident, Coughlan was offered a choice of redundancy; redeployment to a job in the warehouse; or a driver’s retraining programme and he chose the training programme. However, DHL stated that with the October 2015 accident, the company had lost trust in the driver. Represented by Siptu in the case, Coughlan said that since his dismissal, he had applied for 23 or 24 jobs without success and these included courier, driver, general operative, cleaner and store person. The former driver told the court that he commenced work on a Community Employment scheme in May of this year and receives an additional €22 on top of his Department of Social Protection payment. Email “Delivery giant DHL must pay over €70,000 to an accident-prone driver it sacked”. Feedback on “Delivery giant DHL must pay over €70,000 to an accident-prone driver it sacked”.